Well, I figured I’d spare you the image of the poop, and the bunnies kept running away from their photo opportunity. Hence the adage quick like a bunny. (Capturing a snap shot of the bunnies will have to make it onto the Bucket List). Anyhow, my point is this: I come across many new sites and have several new companions now on my morning runs. We are fortunate to live just a few minutes by foot to a spectacular canyon, where the trails merge and diverge so that multiple loops are possible. 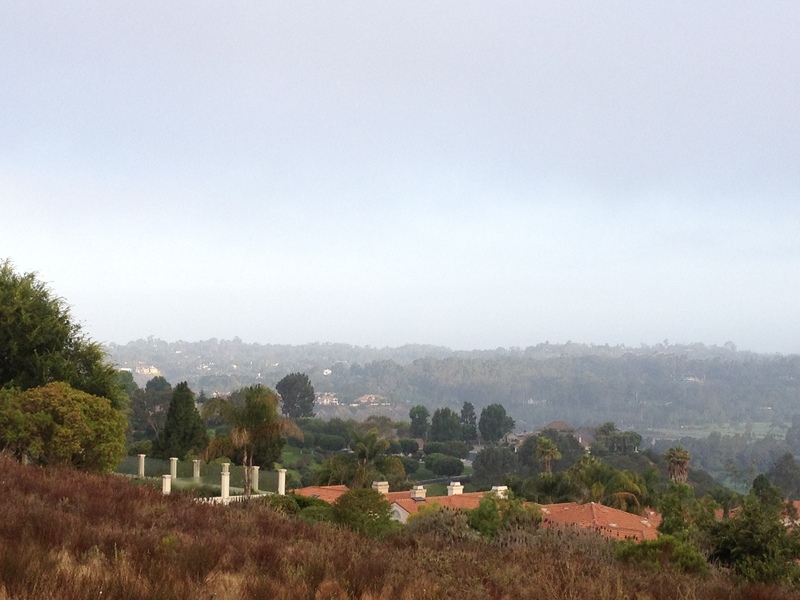 This morning I explored higher and farther than my previous ventures, and if the pesky marine layer had lifted just a few minutes earlier I’m pretty sure I would have been able to see the ocean. My running shoes have carried me over countless trails and roads over the years. From Mexico to Morocco, Sicily to Sweden, and back to the States, I have taken in the grandeur of mountains, lakes, rivers, oceans, fields, parks, canyons and, yes, some traffic congestion. When I run I take it all in. It’s my time– no one tugs at me or argues with me. Sometimes I zone out, but mostly it’s time when my brain sorts itself out. I have mentally composed everything from my daily to-do lists to client nutrition recommendations to kids’ school applications to my father’s eulogy. I owe a lot to this precious time. Each set of shoes has propelled me to new places and contemplations. When I am finished using each pair, I send them out into the world so that someone else can take another step on his/her journey. As I am nearly ready to part with my current set I’m looking for a running shoe store or a fitness center that accepts donations. Feel free to offer up suggestions!